If you would like to learn more about volunteering for a tuntor/mentor program near you, there are a few ways to go about finding a perfect match! 1. Use the online searchable Program Locator form here. 2. Or use our interactive map (that is currently in beta form) here. 3. And be sure to check out the Chicago Program LINKS here. 4. Finally, consider a contribution to help keep the Program Locator FREE and available to Chicago Click this page to learn more. Welcome to the Chicago Tutor/Mentor Program Locator. This web service is intended to help people in the Chicago region find information about non-school, volunteer-based tutoring and/or mentoring programs operating in different parts of the Chicago region. It is also intended to help these non profit organizations get the volunteers and financial support each needs to provide effective services to youth in their areas. Finally, it is intended to serve as a planning tool to help businesses, faith groups and community leaders form new programs where none now exist. See how maps can be used in leadership and collaboration strategies intended to make volunteer based tutor/mentor programs available in more of the high poverty areas of Chicago and other big cities. Such programs can connect adults, ideas, inner city K-12 youth in comprehensive non-school support systems. Where do poverty, violence, school performance and community support intersect? What are the assets in a zip code who could be working together to help tutor/mentor programs grow? Our maps can show you. Using blogs, web site portals, conferences and on-line forums Tutor/Mentor Institute has been "Mapping Solutions" to poverty, poorly performing schools, youth violence and workforce diversity since 1994. However, we cannot keep doing this without your help. You can see our maps in this gallery! You can see more map stories at the gallery online. Who are we? 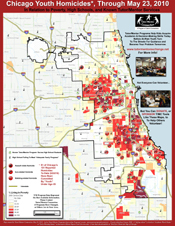 Tutor/Mentor Institute, LLC is a Chicago social enterprise that helps connect business leaders, politicians, educators and citizens with afterschool and tutor/mentor programs, in part through a series of web-based maps, conferences and on-line forums. We created the Tutor/Mentor Connection in 1993 and it operated as a 501-c-3 until June 2011. Until it is reformed it will be supported by investments and revenue raised by the Tutor/Mentor Institute. Using technology donated by ESRI and others , our maps chart instances of issues like crime, violence and failing schools against the prevalence of afterschool and tutor/mentor programs. By showing this relationship, we want to create connections between at-risk students and business leaders, politicians, educators and citizens who are willing to help. What have we done? We have created a Directory showing more than 180 non-school volunteer-based tutoring and/or mentoring programs in Chicago and we share that on this web site. We piloted the use of maps to follow negative news media stories with "REST OF The STORY" map articles, such as these, to build greater visibility and to draw volunteers and donors to tutor/mentor programs in high poverty neighborhoods where violence and poor schools are concentrated.In November 2010 we hosted a map gallery fundraiser, entitled Mapping Solutions, where we displayed our unique maps tp the general public, as well as business and political leaders. These maps are samples, and similar maps showing relationships among community resources - or lack thereof - could be easily be customized to the specific needs of any elected official or community leader. Please contact us for more information. Why are we doing this? In this day and age, maps can show a lot more than how to get from Point A to Point B. We create these maps with hopes that leaders will use them to support their own strategic and on-going involvement in mentoring youth to jobs and careers. By mapping the geographic relationship between social issues in Chicago and their critical solutions, we want to show where our community has opportunities for Chicago leaders to make a difference in the lives of at-risk children. Learn more about our mapping solutions goals. Help us develop these ideas. Tutor/Mentor Institute, LLC is Looking for Sponsors, Partners, Volunteers who want to be Part of the Solution Contact us to see how you or your organization can sponsor this vision. Together we can work toward new Mapping Solutions! Visit the Mapping for Justice blog weekly for more discussion about how we collaborate together, sharing ideas and strategies, for the promotion of more and better tutor/mentor programs everywhere. In general, leaders from anywhere in the community or world can use these maps, the Interactive Maps and the Find A Program link at the right to find contact information that can be used to reach out to potential volunteers or donors, or for families to help enroll a student. These tools help leadership visualize which neighborhoods have enough tutor/mentor programs, or where there are too few programs. Volunteers, donors and business partners can use these maps to determine where to offer talent, leadership, dollars and technology to help existing programs provide constantly improving services, and to help create new programs where needed. Together we can help assure that No Child in Chicago is Left Behind. Enter this section and use the search fields to find a tutoring and/or mentoring program near where you live or work. Contact the T/MC to update your data or add a new organization. Use the Interactive Map to find programs that offer various forms of tutoring and/or mentoring in your part of Chicago. The Chicago Program LINKS section has links to Chicago tutor/mentor program websites. when a program maintains a web site, the information is much more comprehensive than what T/MC provides in the Program Locator database. use the Tutor/Mentor LINKS Library to find other information related to tutoring/mentoring and helping youth living in innercity poverty.